Both Andersen’s poem “We are one people, we are called Scandinavians” and the corresponding melodies are examples of how he kept abreast of the ideological trends of the time. Scandinavism underwent a strong but short growth during the 1840s, and Andersen’s tribute to it became briefly known in several of the Nordic countries. Andersen was inspired to write this poem after a visit to Sweden in 1837. “I became fond of both the country and the people, and felt, as I say, that the boundaries of my home were extended. All at once I understood how related the Swedes, the Danes and the Norwegians are, and with this feeling I wrote the poem immediately after my return: “We are one people, we are called Scandinavians!” It was probably a lapse of memory on his part, because the poem was not written until two years after his journey. In May 1839 Andersen had promised the Swedish author and publisher Bernhard Cronholm a contribution to the Swedish-Danish New Year gift calendar Hertha. During these years the Danes nurtured particularly warm feelings for their Swedish brethren, and in southern Sweden Copenhagen was regarded in many ways as a cultural centre. For this reason, a number of Danish-Swedish poetical calendars were published. Bernhard Cronholm’s appeared for three years running and contained works by both Danes and Swedes – Andersen was the most prolific contributor. In all cases, however, the music was Swedish. In October Andersen was thus able to send the poem to Cronholm, who gladly accepted it for his collection, which was published in January 1840 and moreover included a picture of Andersen facing the title page, which pleased him very much. Shortly afterwards, on 26th January 1840, the poem was printed on the front page of the Danish newspaper Fædrelandet, which supported the idea of Scandinavian unity. Bernhard Cronholm had persuaded the composer Otto Lindblad to set “Jeg er en Skandinav” to music, and his arrangement for a 4-part male choir was published as a music supplement to Hertha. Andersen was very pleased with the composition and wrote to Cronholm: “Please convey my warmest thanks to the composer of “Jeg er en Skandinav”. Tell me where he lives, as I would like to express my thanks in person.” Lindblad’s melody also has a lively, march-like style, which is well suited to a male choir. Although the poem was given this arrangement when first published, it was not placed firmly on the repertoire until 1845 – by the students’ societies at the universities of both Lund in Sweden and Copenhagen. It was probably Lindblad himself – who conducted the students of Lund – who placed the song on the repertoire in Lund. But when Andersen visited Lund as early as in April 1840, he was acclaimed by the students with both this and other songs. When the students of the three Nordic countries met in 1845, the Swedes greeted the Norwegians in Copenhagen Harbour with this very song, and it was also included in one of the first Norwegian collections of male choir songs (from 1845). But after this brief period of popularity Andersen’s poem was seldom sung. The poem was not all that popular in Denmark in the long run, and this might be due to J.C. Gebauer’s rather difficult melody. He arranged the text for solo song and choral refrain in 1839, and Andersen wrote “here in Copenhagen a young man named Gebauer has set it to music and has been very fortunate. He came to see me recently and told me that a rich person had heard his music and would like to have it published for him”. This song was published in 1840, though a little later than Lindblad’s arrangement for a male choir, because Andersen had insisted on this. However, it was probably sung for the first time at a meeting of the so-called Scandinavian Society. This was a group of Danes who were interested in the Nordic concept who met during the 1840s to discuss, listen to lectures, music, etc with a Scandinavian aim. At the meeting towards the end of February 1844 they were thus able to sing Andersen’s Scandinavian poem to Gebauer’s melody, which was described as “a new music”. It was included in the society’s song book, which was published in instalments between 1843 and 1846, and it was also included in no less than ten other song books up to 1870 – thus broadly speaking within Andersen’s lifetime. Gebauer’s melody too has a march-like style that is well suited to a Scandinavian anthem, but the way the melody springs from low to high notes makes it rather difficult to sing. It goes with the rest of his patriotically slanted song production, but is written in a slightly more complicated tonal idiom than the simple style which otherwise characterizes his vocal production. In 1841 the composer tried to get the melody perfomed by the Music Society in a version for male choir and orchestra, but it was rejected, probably because the text had too many political undertones. However, it enjoyed a brief popularity as a song for solo and choir, and was performed, for example, with a male choir of 150, in the Casino Theatre in May 1848. Andersen wrote “at last my song is honoured, and I was told that it would survive everything else I have written! Indeed, one of our most important public characters assured me in all seriousness, that it was the only poem that made me a Danish poet. Now it receives full honours, yet a year ago it was merely the product of flattered vanity”. The ‘public character’ was the politician Orla Lehmann, but the prophecy was not entirely fulfilled. Later, Andersen had to note that “both in Sweden and in Denmark, my song had composers and has become a concert piece, but it has not become popular” – even though both melodies were known, at all events in Denmark. Lykkesholm Manor on the island of Funen, not far from the town of Ørbæk. 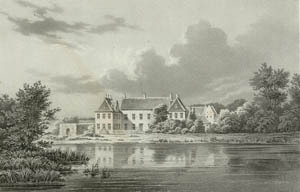 Andersen felt very much attached to several manor houses in Funen, including Lykkesholm, where he was always well received by the Lindegaard family. In 1839 he wrote his Scandinavian poem here. 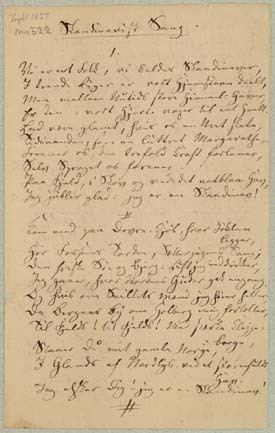 First page of Andersen’s MS for the poem “I am a Scandinavian”.